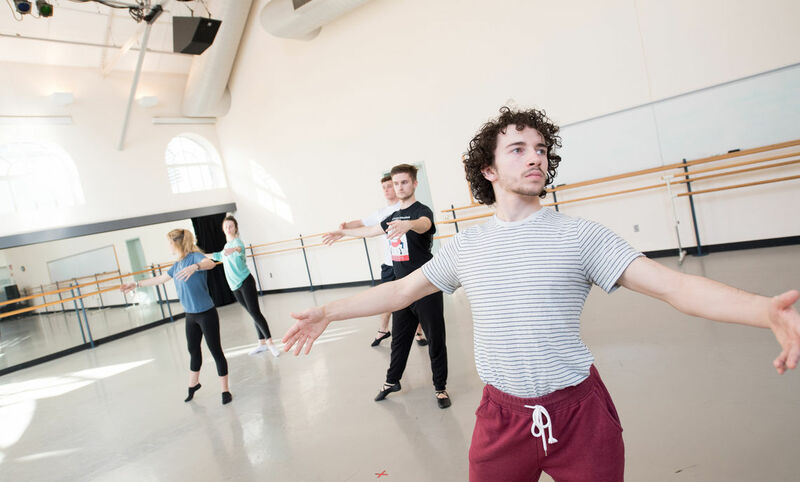 While Renaissance rulers once enjoyed ballet performances in their courts, Brooks teaches her students in “Introduction to Ballet” that the dance has evolved to reflect modern audiences. Ballerinas, known in earlier eras to be elegant and fragile, are symbols of power and grace on the contemporary stage. 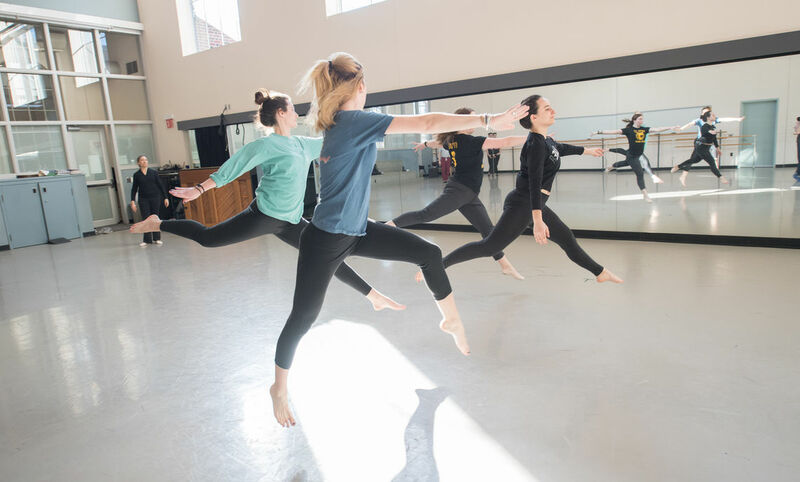 In the studio, students from all backgrounds in dance disperse across the floor to warm up their bodies. Local pianist Pat Daugherty plays a calm melody as Brooks guides the class through controlled movements of the head and neck, then the shoulders and back, flowing through the joints and muscles down to the feet. The piano tune transitions to a lighthearted eight-count, and the students take their positions along the ballet bars. Recalling the sequences from previous classes, Brooks gives opening instructions. In unison, the students arrange their feet, bend their knees, rise to their toes, and reach upward. First position. Plié. Elevé. Stretch. The class preceptor, Lily Fortin ’17, a psychology major and dance minor, reminds them to resist leaning forward, to remain tall and steady. These nuances in technique are crucial—preserving the beauty of the pose and protecting the body from injury. Second position. Plié. Cambré. Stretch. And so on. As the movements become more intricate, Brooks tests for the meaning of en cloche, the French term for “like a bell,” or the pendulum of a clock. On a grandfather clock, the pendulum swings while the frame stands firm. In ballet, the arms and legs move and stretch while the spine and core stay aligned. With each sequence, the students extend themselves just slightly further. 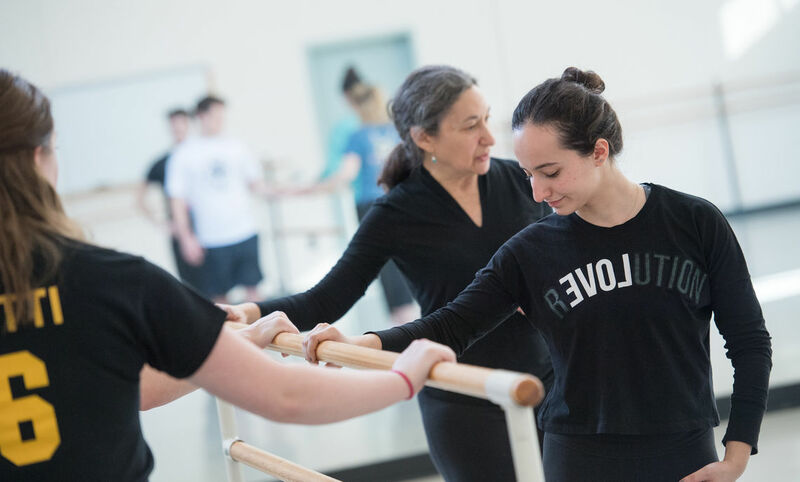 Fortin notes that “Introduction to Ballet” is a space in which to grow as a dancer and build confidence as a person by “diving right into each movement without the fear of being incorrect.” The students are willing to test their physical limits to reach new milestones in their form. The class gathers at one end of the studio for cross-floor exercises. Majestic music animates the room, and then in distinct lines, groups of students take deliberate, delicate strides across the floor. Each part of their step, the extension of their arms, and the direction of their gaze have a purpose in the brief performances. When the day’s practice concludes, members of the class bow to each other, the teacher, and Dougherty at the piano. Basic technique and theory of ballet, including the anatomical laws governing ballet movement and investigation of the style and aesthetic of ballet technique. The course emphasizes the practice of dancing as well as that of writing, thinking and speaking clearly about ballet.